At our Amsterdam Seed Center shop, we are growing different varieties of autoflowering strains in our shop window. This time it's the Auto Jack from Paradise Seeds. Lamp: 273 Watt LED 'Super Nova' with adjustable blue/red spectrum for veg. state (growing) and flowering. This lamp is on 24/7! Not the most ideal situation, even for an autoflowering strain, but nice to look at, cool to display in our shop window, nice to smell through the whole shop and, when finished, a proper smoke indeed! I'll keep a grow report with photo's every week. that's to good to see ur grow here... I have been to ur shop in November '12 and I loved to see ur plant in the window, I just forgot which strain it was. Can u remember? That would be the Auto WhiteBerry mate. Was an awesome smoke! So.... finally.... The second seed we'd germinated was also killed by one of our way too curious customers, even though it says "Do NOT touch the lamp or plant" in seven different languages. This seed was germinated last Friday, the 8th of March. This time, we didn't germinate in a jiffie this time, but staight in to 'clone & seedling soil'. 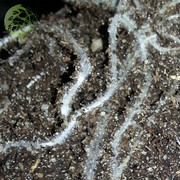 See the roots developed already! The beautiful green colour! Healthy as a horse! Cannabis Caesar Salad, anyone? 5 days after the previous post. 10 days after germination. Looking healthy and strong. Beautiful green leafs and thick sturdy stem. Nutrients; Just water. LED lamp on 24/7. View from the street into Amsterdam Seed Center store window. Auto Jack. One week later. 17 days after germination. Look at that stem and the short internodes.